1. The Grove kicks off The Year of the Dog during our Lunar New Year Celebration on January 28 from 2-5PM. The Original Farmers Market will also host festivities starting at 12PM. 2. Come together this Lunar New Year! It’s the perfect time to visit with family, share meals and clean & decorate the home to make room for good luck in the coming year. 3. Visit the 12–foot tall Foo Dogs on 1st Street. Foo Dogs are guardian lions that traditionally stood in from of Imperial palaces, temples and homes and were believed to provide powerful mythic protection. 4. 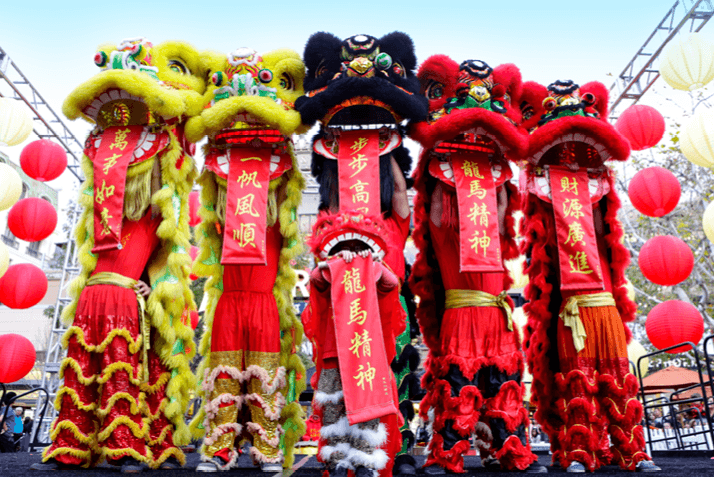 Experience the traditional Dragon and Lion dances. These traditional elements of Chinese Lunar New Year celebrations incorporate loud drumming and clashing of symbols that chase away bad luck and evil spirits from the previous year. 5. Watch performances by the Beijing Opera, K-pop group The Koreos from UCLA and traditional martial artists. 7. Watch local artists create traditional calligraphy and sugar paint masterpieces! 8. Experience a demonstration from Master Shi, an award-winning folk dough figure artist. He will share a 4,000-year-old tradition for Chinese New Year festival celebrations. 9. Adopt a dog from Wags & Walks and Michelson Found Animals at The Original Farmers Market from 12-4PM. 10. Receive traditional red envelopes from The God of Wealth. These include little surprises and will be gifted throughout the month of February. Be sure to join us at The Grove’s Lunar New Year celebrations for time-honored traditions to honor the past and to give thanks for our blessings.